The Asia Trip: First Meal... Chicken Katsu! A while ago, I did a spotlight on McDonald's in Japan (not knowing that I'd be actually going there not too soon thereafter). 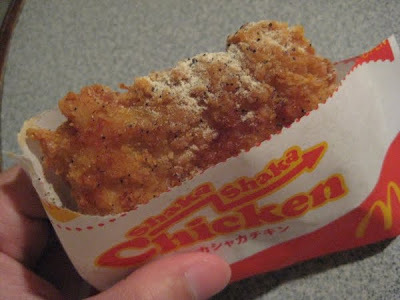 One of the items that caught my interest in that post was the Shaka Shaka Chicken which upon going to Japan, I had to try. 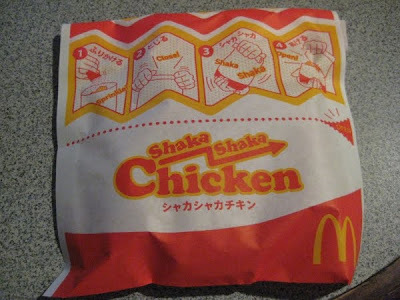 As you can see above, the Shaka Shaka Chicken is served in a folded-over paper pouch with easy-to-follow picture instructions. There's even some English words thrown in in case you get confused! The dotted line that runs through the middle of the pouch is where you tear the pouch open after eating for easy access without making a mess. A brief aside about Japan and eating; people don't walk and eat at the same time here. No, it's not because they are horrible multi-taskers and are liable to walk into things, I'm pretty sure it's just a cultural thing and considered rude to do so. People in Japan mostly just dine-in, but as a result when you're walking on the street, there aren't any trash cans... which is very weird if you're from America and trash cans are pretty much everywhere. I went to a mall where there were no trash cans at all... not even in the bathroom (they use hand dryers)! I often ended up carrying my trash for quite a bit until a trash can could be found. But back to the Shaka Shaka Chicken. I'm not sure how they pronounce it... maybe "shake-ah shake-ah?" It's supposed to be the sound the bag makes when you shake it I think... much like "shabu shabu" is the sound your meat and veggies make as you swish it around the broth. So Shaka Shaka Chicken... the whole concept is to add a different flavor to your commonplace chicken patty by shaking it with a packet of powdered spices. It's a little bit like Shake'n Bake, except after the meat is breaded and deep-fried... so it's more like just "Shake." You can choose from 3 different flavors: pepper, cheese, and lemon. 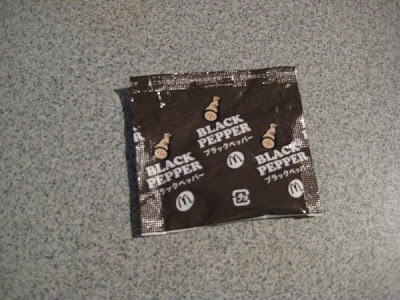 I chose pepper. 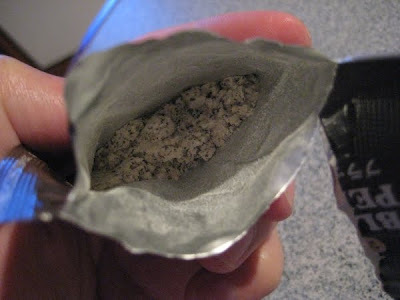 Hm... Looks like a blend of ground white and black pepper. White pepper tends to be a slightly milder than black pepper. As you can see from the picture above, I either didn't shake well enough despite my vigorous efforts or the pepper doesn't coat very evenly. Still, the pepper lent another dimension to the chicken with just a slight bit of a kick. The chicken itself is a fairly moist breast piece with a crispy outer breading. As part of the 100 yen value menu, it makes for a pretty good snack or a light meal. pretty funny about the whole trash can deal. that is pretty cool concept, did you try any other flavors? @anon: I didn't have the opportunity to try any other flavors... too many other things to try. @Helen: What? You said you were living off of onigiri! I tried this in HK. I think the whole shaking thing is a better idea geared towards kids. It's impossible to evenly coated a greasy piece of chicken unless it's fresh from the fryer. I live in Japan right now as a military dependent. Thank you for the information on this. I'm doing a presentation on Japanese food and thought it would be fun to show the differences between American McDonald's and Japanese. I like the taste of the Shaka Shaka Chicken, particularly the cheese-dust one, but I find it hard to get the chicken evenly coated when shaking it. I think maybe just sprinkling it on might yield the best (if messy) result. FYI to any visitors going to Japan. Trash cans will almost always be located next to vending machines (which are available like everywhere it seems like).